The first ball was kicked in the Nigeria Professional Football League, NPFL for the first time on Sunday January 13, 2019, yes, the first time in half a year. The last time any league football was played happened to be in June 2018 when a World Cup break took effect, then wrangling that ensured the League ended in a hotel room where all clubs agreed that after Match Day 26, it should be over. Two games surely burned the headlines on Match Day 1 and that would certainly be in Uyo and again in Jos. Star studded Akwa United were home to El Kanemi in a game the home side just had to win. They just had to win because the pre-season rating by the bookmakers put Akwa United as title hopefuls. Everything about their team was top notch- the stadium, playing personnel, well.. er.. not the coaching staff though. El Kanemi held on and would have been happy with a draw until it happened in added time. 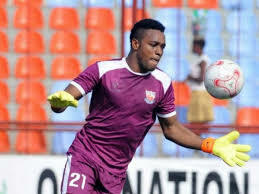 Their goalkeeper, Ojo Olorunleke tried to push forward with the ball as the game was still goaless in added time. He probably thought his side needed to score, but then lost it in the center of the pitch. It took two El Kanemi touches from two players to score. A heartbreaking goal for the home side, but one that El Kanemi’s Ba’Akaka Ajikolo will not forget in a long time. But what was going through Ojo’s mind? I have read reports on social media sites and the blame is on him, some even suggesting match fixing, but should he take the entire blame? One could say goalkeepers do this towards the end of games when they are one goal down and chasing the game. If the unexpected happens they would only go two goals down. In this case, Akwa United already had a point in the bag and overzealousness from him made them lose it. This make sense. Another school of thought says he shouldn’t have pushed forward with his defenders behind him, but this is where I disagree. Did Akwa United settle for one point or did they really want three? A team that wanted more would have pushed forward with a high line, but the defenders kept the line low. At the time Ojo pushed forward, I expected the defence to go with him. If that had happened, they would have forced the ElKanemi players to fall back too, but they didn’t. I thought Ojo tried something noble, but his team mates were too timid to support him. All in all, the goalkeeper made a mistake and would regret and remember it every time he tries to push forward with the ball in a game. As we say in local parlance where I live in Port Harcourt, Day never break and we don dey beat referee for league. What happened in Jos is the saddest part of Nigerian football. The fact that we have to beat up the referees in games because results did not go our way. The game in Jos was between Plateau United and FC Ifeanyi Ubah. It ended goaless and as soon as the final whistle sounded, hoodlums rushed in and began or attempted to physically assault the referee. First, beating up referees at the stadium is not in itself a big deal because I think it is an African/ Nigerian thing. In Nigeria, we believe that the only way out of disagreement is to go physical. Might is still right as far as Nigerians are concerned. This is why we lynch suspected armed robbers on the streets… keyword, SUSPECTED. We beat up our maids and other helps at home when it does not seem that they understand what we want them to do. We beat our kids when they err and we even beat our juniors at work when there is a disagreement. Do you know that if you offend me as a Nigerian and I have friends in the police or army, I can get you beaten up by my friends? Good thing we have now established the fact that Nigerians go physical at the slightest opportunity so let us face the fans in Jos. Moving on, how do we end this issue of fans beating up referees? At the risk of sounding redundant, The League Management Company must take a tougher stance on this. Can we dock points more regularly? Can we shut down stadia for full seasons? Can clubs be made to pay fines of at least 15 million naira for violence, to be remitted before their next home game? After six months of inactivity in the League, violence on the first match day certainly de-markets the efforts of all to make the league work. And violence will happen everywhere if emotions run amok amongst fans, but the key thing is the reaction of the league and FA to these things. We will wait for the LMC to decide what happens to the fans and stadium in Jos. Six games did not hold because Lobi Stars and Rangers played on the continent while Kada City FC, Remo Stars, Bendel Insurance and Gombe United were given the first two match days to rest. Of the games played, Enyimba put up a top performance beating MFM 2-0 in Aba. In Lafia, Nasarawa United beat Abia Warriors 1-0, ending their Match Day 1 record of never losing since they got to the top flight. It was Abdullahi Abubakar's strike on 20 minutes that gave victory to Nasarawa United. Chinedu Sunday scored as Kano Pillars began life without Junior Lokosa by winning 1-0 against Heartland. Matchday of the NPFL takes place this midweek. Hopefully, Match Day 2 will be much better than Day 1.